Cheap return flights from Spain to Mexico City from €355! airBaltic promotion code: get €15 discount for your next flight! *see UPDATE below* SkyTeam partners Air France-KLM or Alitalia (in some cases also Delta Air Lines or Air Europa) offer greatly discounted return flights from Spain to Mexico City already for €403! Look for flights departing from Madrid or Barcelona. Note that fare is inclusive of checked in luggage as well as all taxes and onboard meals. Good availability throughouth whole year 2019. Want reasonably priced flights to this usually fairly expensive destination in Mexico it is great option. Flights have on short layover in Rome, Paris, Amsterdam or Atlanta depends on chosen routing.. *UPDATE*. : Price drop from Barcelona also new route from Bilbao to Mexico City available..Return flights from Spain to the capital of Mexico already for €355 roundtrip! This promotional sale with Air France/KLM is valid in travel period till 30th of June then from September till 16th of December 2019 also in January 2020. Book this discount by 20th of March or until sold out. Max stay 3 months. Travel dates based on this Air France/KLM promotion are the easiest to check directly with the airline as they offer view by months so you can easily find the lowest fare available. Alternativelly you can also use Google Flights. We recommend to check your connection possibilities through service of Skyscanner. This tool gives you quickly an idea which airlines are available from your homecity. 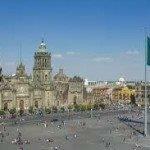 To book some afforeable accommodation in Mexico City we recommend Booking.com. Booking sample of cheap return flights from Spain to Mexico City from €355! In this case you would be departing from Maerid to Mexico on 7th of May. Your return flight from Mexico City back to Spain would take place on 20th of May 2019.